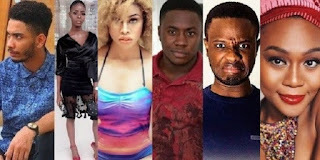 While speaking during an interview with Pulse Nigeria, the first evicted Big Brother Naija housemates; Bitto, Princess, Vandora, Dee One, K-Brule, opened up on which housemate they think should win the N45 million prize. Bitto: “It’s obvious that a lot of people have their favourites in the house and the person who stays till the last week with the highest number of votes automatically wins. I don’t think Big Brother should project someone just going into the house, sleeping most of the time, being quiet most of the time and sliding into the finals and then winning. K-Brule: “I love Ifu. I love Rico, I think he is very entertaining, very funny, and if we are to believe everything that he said, he has had it very tough. But for some reason, I just love Angel. I feel like, how can one man be a Kung fu master and be a kickboxer?